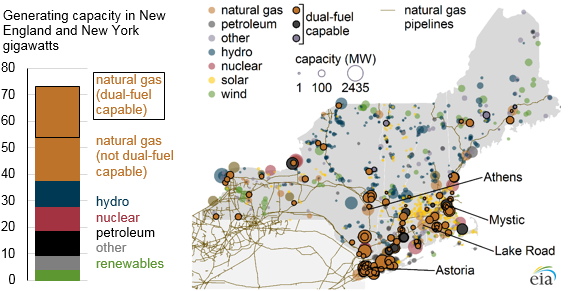 Power generation in New England and New York is largely dependent on natural gas, which accounts for more than half of the region’s electricity generating capacity. About 58% of New England’s natural gas capacity has dual-fuel capability, meaning it can switch to other fuels such as petroleum-based fuels. Data from the U.S. Environmental Protection Agency’s (EPA) continuous emissions monitoring system (CEMS) reveals how certain plants in New England and New York switch between fuels in certain situations. Weather can have a significant effect on both electricity and natural gas demand. During times when natural gas supply is constrained, particularly during the winter, some plants are forced to reduce their output, or shut down entirely, as individual fuel sources become unavailable. Plants with duel-fuel capability, however, are able to switch to a different fuel. The dual-fuel capability of natural gas-fired generators in the New England and New York regions has proven critically important for maintaining grid reliability, particularly during cold weather events that create increased demand for both natural gas and electricity. The bomb cyclone event, which spanned from December 28, 2017, to January 8, 2018, highlighted the value of dual-fuel capability when unusually cold weather created additional demand for natural gas for heating which, in turn, reduced the availability of the fuel for electricity generation. During this event, several dual-fuel capable generators switched from natural gas to petroleum to continue generating electricity. EPA gathers hourly power plant operations and CEMS data through the Air Markets Program from most of the fossil fuel generating capacity in the United States. In the New England and New York regions, CEMS data are collected for 33 gigawatts (GW) of the 36 GW of natural gas capacity. CEMS measures both carbon dioxide (CO2) emissions and the consumed energy input for each power plant. The relative values of CO2 emissions and energy inputs can be used to determine the energy source burned. For example, the combustion of natural gas produces 117 pounds (lbs) of CO2 per million British thermal units (MMBtu), and petroleum, which has a higher carbon content, produces 161 lbs of CO2/MMBtu. Reviewing a plant’s operating profile over time can reveal how it reacts to events that affect electric reliability. The following examples show how different types of plants reacted during the cold weather event of late December 2017 and early January 2018. Lake Road Generating Plant is an 866 megawatt (MW) natural gas-burning plant in Connecticut. During normal operations, Lake Road cycles each day, and during the bomb cyclone event, generation did not significantly change from normal operations. Astoria Energy is a 1,218 MW combined cycle plant in Queens, New York. The plant generally burns natural gas and cycles on a daily basis, but during the bomb cyclone event, the systems switched to burning petroleum and, during the second week, multiple units ran continuously. Mystic Generating Station is a 2,273 MW plant near Boston, Massachusetts. The plant’s natural gas-burning combined cycle systems run regularly by cycling throughout the day and continued generating through the bomb cyclone event. The plant’s petroleum-burning steam turbine does not run normally but was called upon to generate electricity during the bomb cyclone event, causing an increase in CO2 emission rate. Athens Generating Plant is a 1,203 MW combined cycle plant in upstate New York that is not able to fuel switch between natural gas and petroleum. The plant ran during most of the two-month period but shut down during the bomb cyclone event.